Francois et Mimi’s 3.4A Rapid Car Charger (Model: 3ALBK1) bucks the trend of Apple iOS device chargers by coming in black, rather than white. While this may initially seem an odd choice (after all, Apple = white), it arguably blends in better with most car interiors. Francois et Mimi Apple Certified 3.4A Rapid Lightning Car Charger packaging. Style-wise, the 3.4A Rapid Car Charger is OK, but I wouldn’t exactly call it stylish. With that said, the bulbish charger portion with white script Francois et Mimi will likely be sight mostly unseen in many vehicles. Similar to a previous product I reviewed, this has a coiled cord, but there’s also an uncoiled portion that gives it a little extra length over that other product. Nevertheless, the fact that that coil is still there does mean that its five foot total length is still restricted a bit versus cables that aren’t coiled. 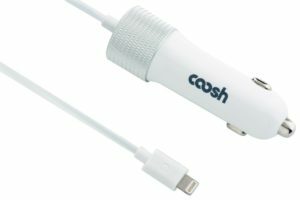 The coiling does have the advantage of keeping the cable more out of the way and cleaner in appearance, so if you don’t have a large distance from your car’s charging port to where you keep your phone, you may actually prefer this design. In my case, while it’s a bit too short for comfort in my Toyota Prius, it fits far better in my wife’s Toyota Highlander. 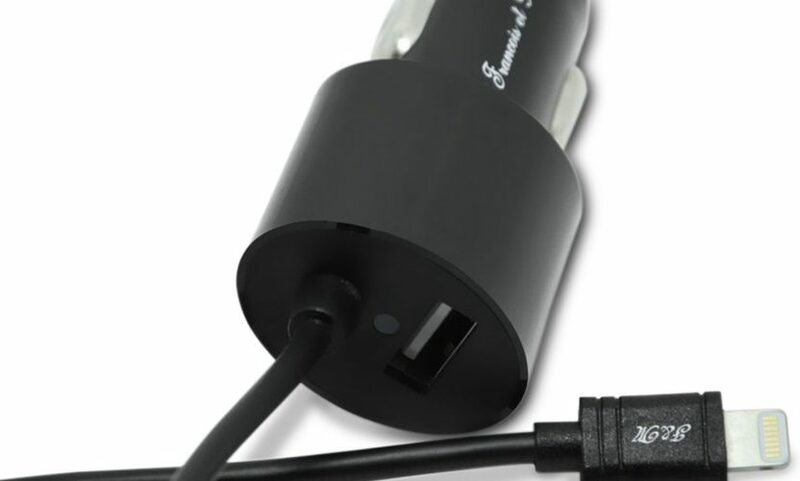 Francois et Mimi Apple Certified 3.4A Rapid Lightning Car Charger. Spec-wise, the 3.4A Rapid Car Charger delivers. Its input is DC 12-24V with a lightning line out certified in Apple’s MFi Program (“Made for iPhone/iPod/iPad”) rated at DC 5V/2.4A for rapid charging, and of course offer over-charge protection. The sleeve on the lightning connector is suitably spartan so it should fit into most cased Apple products. It also has a standard USB out, which is rated at DC 5V/1A for slow charging any other USB-based device. 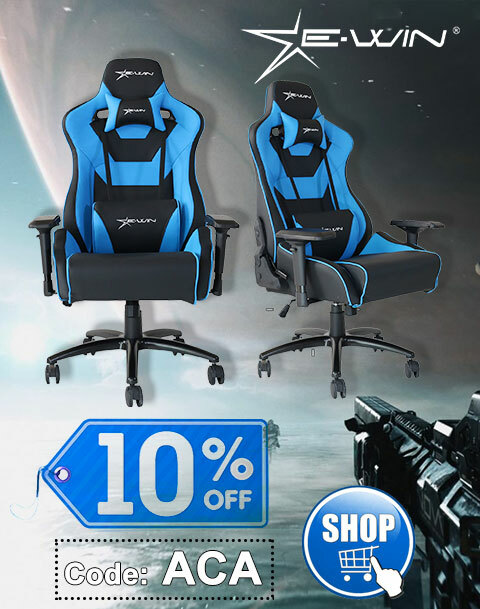 Finally, there’s a one year warranty. Special thanks to Francois et Mimi for the review unit.